Since we introduced you to this sure-footed, sharply focused ASX developer back in August , AUZ has given us ample evidence that it likes to keep itself extremely busy. AUZ is a company with a simple but high-impact objective: to emerge as a major global supplier of critically needed battery and technology metals. It’s hoping to tap into the ongoing energy storage industry and the burgeoning battery-fuelled electric vehicle revolution... for both consumers and investors. 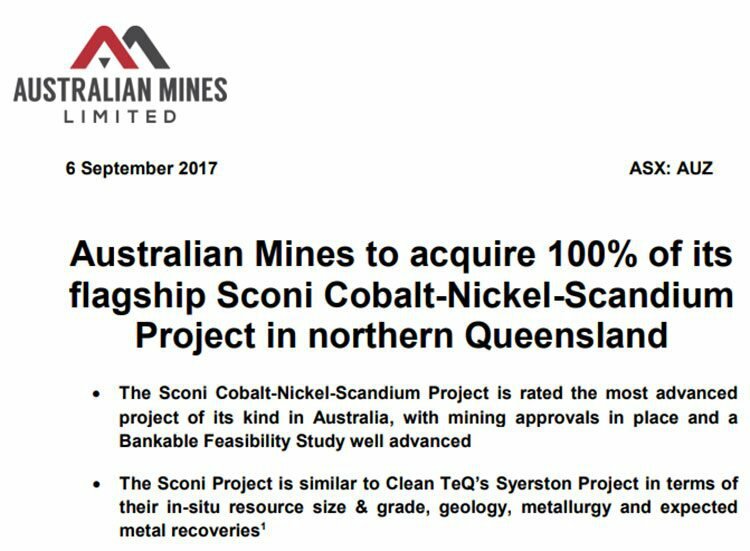 AUZ is doing this by developing two world-class, already JORC’d cobalt, nickel, scandium projects in NSW and Queensland: Sconi and Flemington. Each project is estimated to have a mine life of at least 20 years and has potential to provide 95% of the raw materials used in emerging battery technologies. AUZ isn’t wasting a moment either. Since it first crept onto our radar, the company has been neck-deep in positive news flow. 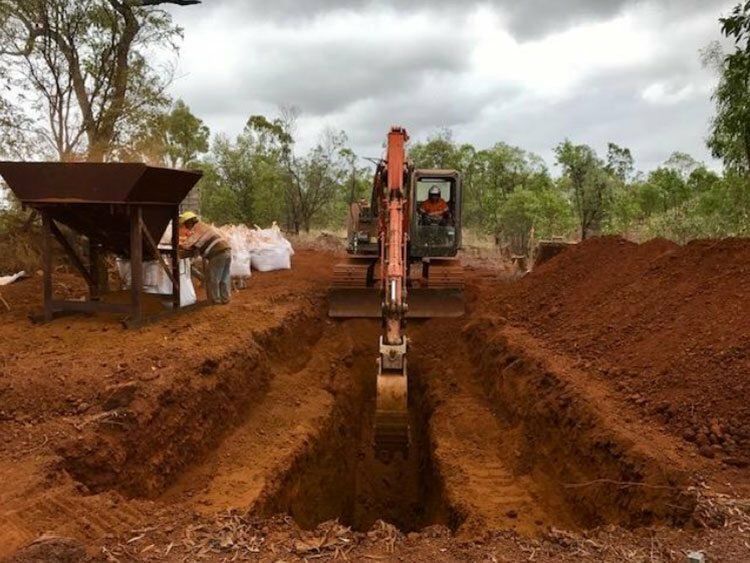 As announced in September, AUZ is acquiring full ownership of the Sconi Cobalt-Nickel-Scandium Project in northern Queensland by signing an agreement with its JV partner, Metallica Minerals (ASX:MLM). 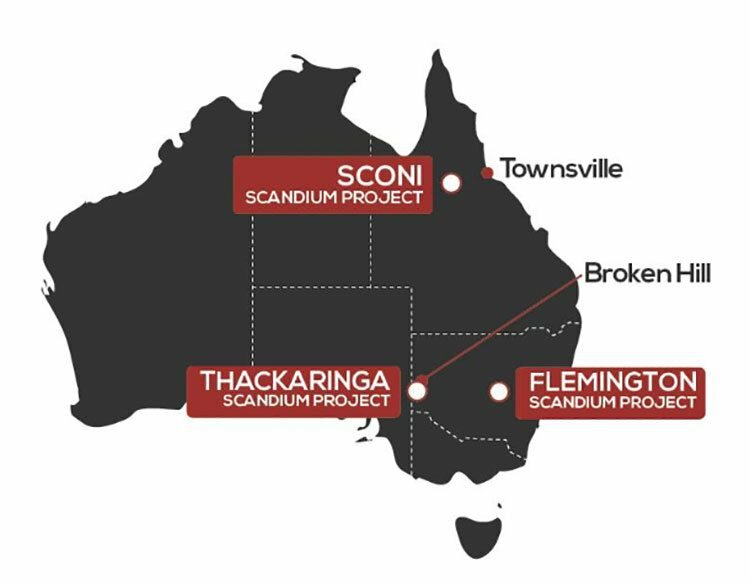 Sconi is considered the most advanced project of its kind in Australia, with mining approvals in place and a Bankable Feasibility Study (BFS) in progress as we speak, which is expected to be completed by April next year. To give you an idea of what AUZ has in its hands, Sconi has been compared to the $673 million-capped CleanTeQ’s (ASX:CLQ) Syerston Project in terms of in-situ resource size and grade, metallurgy, geology and expected metal recoveries. With its flagship project tracking along nicely, AUZ announced in September that a trial mining program has commenced at Sconi, with all appropriate mining and environmental approvals already in place to allow the company to expand to a full-scale mining operation. 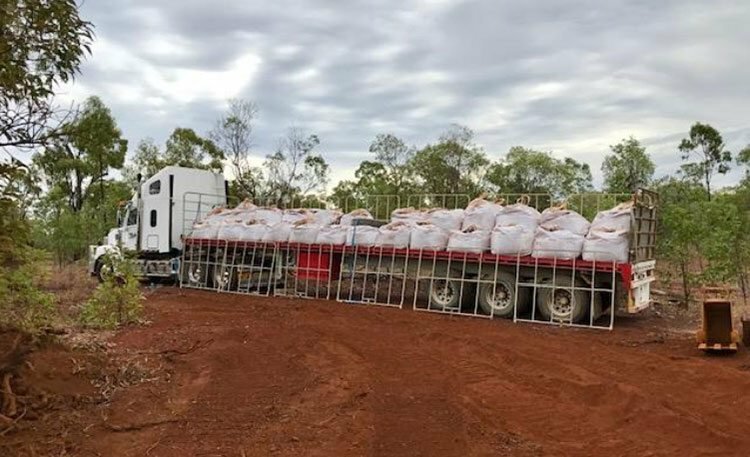 An initial 20 tonnes of cobalt and nickel-rich ore is being extracted, with the material transported to AUZ’s Perth-based demonstration-size processing plant. Based on the pilot-scale processing work recently undertaken, this 20 tonne bulk sample from Sconi is expected to produce up to 160 kilograms of battery grade nickel sulphate, 20 kilograms of commercial grade cobalt sulphate, and at least 5 kilograms of high-purity scandium oxide. Encouragingly, the entire output from this initial run has already been allocated to potential international offtake partners. 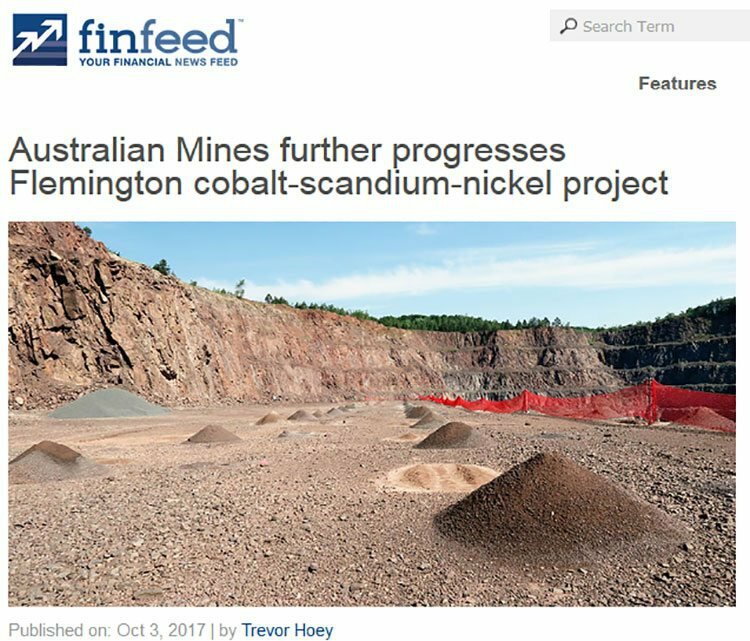 Things are also shaping up at AUZ’s Flemington Cobalt-Scandium-Nickel Project, with a water license now secured , and a Preliminary Environmental Assessment (PEA) submitted — a major milestone towards the granting of AUZ’s mining lease, which covers an area of nearly 4000 hectares. A key point to bear in mind is that Flemington is considered to be the direct western continuation of CleanTeQ’s Syerston ore body, separated only by a tenement boundary. Syerston is one of the largest, highest grade, undeveloped nickel and cobalt resources outside Africa, and contains the world’s largest, highest grade scandium resource. What AUZ has in Flemington is regarded as the other half of that deposit. Importantly, the scandium footprint at Flemington has also increased threefold based on assay results from a Resource extension drilling program. That’s not all AUZ has going in its corporate repertoire. It has commenced a detailed airborne geophysical survey of its Thackaringa Cobalt Project, near Broken Hill in NSW. While its advanced projects remain AUZ’s central priorities, Thackaringa offers considerable exploration upside. All in all, it’s been a fruitful couple of months for this $49.8 million-capped battery metals developer. And investors have clearly been paying attention — recent news has positively affected AUZ’s share price, with an increase of more than 50% since June. AUZ is also strategically capitalising on a fertile market that’s expected to see plenty more growth. The battery technology rally is in no danger of slowing down, with electric vehicle sales projected to grow to over 20 million by 2020. Things will continue to heat up for the fast-moving AUZ as it makes the transition from development into production. The news will likely flow thick and fast, including completion of the processing plant construction and a Pre-Feasibility Study (PFS) for Flemington. In keeping with the no-nonsense style of this ASX developer, then, let’s cut to chase. Underpinning the game-plan of Australian Mines Limited (ASX:AUZ) is a clear, lucid strategy: to develop world-class cobalt-nickel-scandium assets with a view to emerge as a major global supplier. This is a company with an eye to the future. AUZ recognises the increasingly pervasive global shift towards greener, more sustainable energy sources, which includes the use of batteries to power cars, homes and industry. As we’ve touched on, AUZ’s key advanced projects, Sconi and Flemington, have the potential to provide a significant quantity of the raw materials used in emerging battery technologies, with both projects having projected mine lives of at least 20 years. AUZ’s flagship project alone, Sconi, has potential to produce the commodities that constitute 95% of the raw materials in a Tesla Model S battery pack cathode (80% nickel, 15% cobalt) and 100% of the iPhone battery cathode, made exclusively from cobalt. We first introduced you to AUZ in August with the article, The Energy Metal You Have Never Heard Of: Demand Set to Increase by 800% — a title that speaks for itself when it comes to the burgeoning scandium corridor. In that article, we looked at AUZ’s broader battery and technology metals approach, and walked you through the highlights of the Sconi and Flemington Projects. We also analysed the emerging scandium market in detail. We’re not going to rehash all of that information here, but it’s worth spelling out some key points about this lesser-known metal. You may be familiar with the roles that cobalt and nickel play in the Tesla-powered electric vehicle revolution, and how these figure into a greener energy picture more broadly. Regular readers of Next Mining Boom will know that this is a topic dear to our hearts. Scandium on the other hand, which has been touted as a super-metal, is more of a quieter achiever. Yet it’s one which is highly sought after. Annual scandium demand is anticipated to increase by at least 800% over the next decade. Scandium is generating interest as a potential breakthrough mineral, especially in the aircraft industry, where it can be alloyed with aluminium to increase strength and corrosion-resistance. Bearing this in mind, let’s take a look at the most recent developments on AUZ’s radar. A PFS completed on the scandium ore body has confirmed this project as economically and technically viable, capable of producing 50 tonnes of high purity scandium oxide per year over a 20-year mine life, and generating an average EBITDA of $59 million per annum. Sconi is rated one of the most advanced cobalt projects in Australia, and is similar to CleanTeQ’s Syerston in a number of ways, including size, average feed grade, metal recovery grades, and final commercial products. Moreover, as with Syerston, given that scandium is produced alongside the cobalt and nickel sulphate products for virtually no additional operating cost, scandium production at Sconi can be seen as a kind of ‘sweetener’ — the cherry on top of a highly lucrative technology metals cake. Subsequently, AUZ can offer its customers a reliable source of high-grade scandium oxide at a significantly discounted price to peers operating in this space. The consideration for the acquisition is to include $3.5 million in cash and the issue of AUZ shares on completion of the BFS and commercial production. Importantly, AUZ has raised $3.5 million via a placement at $0.015 per share to assist in the initial cash payment for the Sconi acquisition. 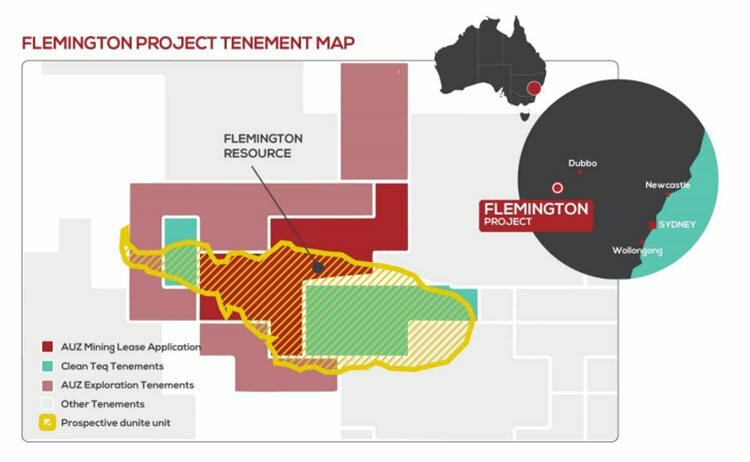 This puts AUZ in full control of both the Sconi and Flemington Projects, and in an excellent position to progress its already advanced offtake discussions with international battery and vehicle manufacturers. AUZ is on track to reach a final investment decision, given that it already has a mining lease and environmental approvals in place. The BFS on Sconi is advancing to schedule and is due to be done and dusted by April next year. Gaining complete ownership over Sconi reinforces overall confidence in the future success of a long-term mining and processing operation and brings AUZ one big step closer to its goal: emerging as a leading technology metals developer and long-term supplier of cobalt and nickel sulphates to the global battery materials market. To shore up the initial interest from end customers across Europe, Asian and the Middle East, AUZ has begun construction of a demonstration-size processing plant to produce samples of cobalt, nickel and scandium products. The pressure acid leach (PAL) and solvent extraction (SX) plant will be capable of processing more than 15 tonnes of ore per week from the Sconi and Flemington projects and will provide proof of concept ahead of a final investment decision on a full-scale processing operation at Sconi. The latest news on this front came at the end of September , with AUZ reporting that trial mining operations have commenced at Sconi to collect a 20 tonne bulk sample to run through the demonstration-size processing plant in Perth. AUZ is processing its mined ore from Sconi to produce 160 kilograms of nickel sulphate, 20 kilograms of cobalt sulphate and 5 kilograms of high-purity scandium oxide. It’s worth noting that as the ore body outcrops, the first buckets of dirt extracted at Sconi are actually cobalt and nickel-rich ore. Therefore, there is almost zero stripping required at Sconi for this initial operation, which translates to reduced costs. All commercial-grade samples obtained as part of the trial-mining operation have already been allocated to current offtake discussion partners in Europe, Asia, the UK and North America. In fact, demand for samples has been so strong that AUZ will be expanding this trial mining program to satisfy these additional requests. Flemington already hosts a world-class resource in its own right, able to produce cobalt sulphate and high-quality scandium oxide for global customers. Here, AUZ has in its sights one of the highest grade scandium deposits in the world, with a Mineral Resource of 3.14 million tonnes at 434 parts per million scandium, including 2.67 million tonnes at 435 parts per million scandium in the measured resource category. The scoping study released in March indicates that Flemington has a long operating life, with up to 45 years of production, suggesting that the operation will generate net cash flow of A$677 million over the first 18 years of the project’s life. What’s more, AUZ’s recently completed drill program indicates there’s potential to further expand this resource, given that the prospective geological unit extends across almost the entire length of the company’s mining lease application area. The most recent news to come out of Flemington? AUZ has now secured a permanent water licence for this project that will more than cover the current proposed scale and life of operations at this project, making this a major step in progressing Flemington towards development. As this water licence was an existing allocation, purchased by AUZ on the open market, a future mining operation at Flemington will have no impact on the total water usage by this region. This was a deliberate decision — AUZ is invested in minimising the project’s footprint in the rural community, and is also looking into a number of renewable energy options to power mining and processing operations on site. Alongside securing this water licence, AUZ has also submitted a Preliminary Environmental Assessment (PEA) under the New South Wales Environmental Planning and Assessment Act. Detailed work completed in preparing the assessment hasn’t identified any significant environmental issues, so this is a significant milestone towards the granting of the company’s mining lease which covers an area of nearly 4000 hectares. Encouragingly, the scandium footprint has also increased threefold at Flemington based on the assay results from a Resource extension drilling program, with the high grade scandium mineralisation confirmed to outcrop across the project area. It’s been clear for a while that AUZ is very much a newsflow-driven story, and the coming days look like they’re going to be busy ones for this ASX developer. It has a maiden cobalt Mineral Resource and upgraded scandium Mineral Resource Estimate in the works, construction of its processing plant almost complete, and offtake discussions to be finalised. On top of that, over the coming months, AUZ plans to formalise its market intentions by completing its BFS on Sconi, which is expected to be done and dusted by the end of April 2018. A final investment decision on a full-scale mining and processing operation will follow soon after. ...To name just a few of the developments that AUZ has up its sleeve. All of these constitute major milestones to transpire in the not-so-distant future, which could see a continuation of share price momentum. With multiple world-class projects, high-impact production visibility and some serious leverage to the energy storage corridor, $49.8 million-capped AUZ is only going to keep on growing, and it may only be a matter of time before its small-cap days are a distant memory.